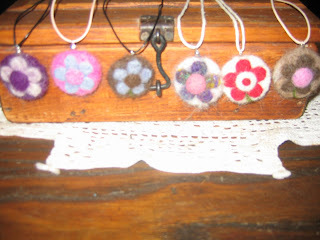 New in our farmstand is our new Needle Felted Necklace Pendants. They are made with both alpaca and wool, dyed in different colors. As you can see no two are the same. You can also interchange them on a chain or something else you may have. I am trying all kinds of different color combos, as well as shapes and designs, but for now I having fun playing around with these. I love these necklaces !!! Love the brown with the blue flower. So Cute !!! The pendants came out great! I am going to take a crack at making a few sunflower ones, if they come out nice I will post them! i love these neclaces, got to give them a go.